The Hyundai lineup includes a variety of vehicles that provide impressive technology features paired with efficient engine options and great safety systems. A pre-owned Hyundai models can give drivers access to these capabilities without a break-the-bank price. Buy Direct Truck Centre offers many used Hyundai models in Kelowna BC for car shoppers to consider. Buy Direct Truck Centre provides a variety of pre-owned car, truck and crossover models from Hyundai and a variety of other brands. Our inventory also includes an extensive selection of wholesale models that offer even more value. 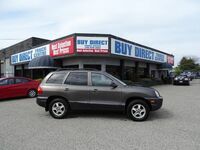 Our inventory of vehicles can be viewed here on the Buy Direct Truck Centre website. The Hyundai lineup includes multiple car, crossover and SUV models. Small cars like the Hyundai Elantra and Accent deliver impressive fuel economy ratings paired with comfortable interiors. These cars are ideal for shoppers looking for a daily driver that will deliver nimble handling while earning impressive fuel economy ratings. The Accent and Elantra are offered in hatchback body styles that increase the storage capacity and versatility of the cars. The midsize sedan segment offers comfortable and capable cars that appeal to a wide variety of drivers. If you are looking for a comfortable car for your daily commute, or an efficient family car, the midsize sedan segment is the place to look. The Hyundai Sonata has long stood out in this segment, offering multiple engine options and a host of great technology features. Crossovers and SUVs are becoming more and more popular. Hyundai offers some of the top models from these popular segments. This includes popular vehicles like the Tucson, Santa Fe and Kona. Many of these vehicles have found their way to the pre-owned market and are now available here at Buy Direct Truck Centre.